As soon as sugar pumpkins hit the Boston markets every fall, I make this savory baked stuffed pumpkin recipe, a real classic New England family favorite seldom seen in local restaurants. Even though this stuffed pumpkin recipe is very easy to make, it needs to bake slowly for a couple of hours to bring out the wonderful flavors. The tantalizing smells will make your whole family very hungry - so you may need to have a couple of snacks available while it cooks. Everyone seems to make this fall treat based on their own unique stuffing mixture. 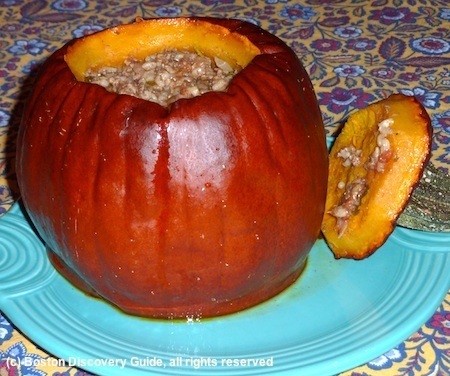 In the recipe on this page, you'll find my favorite ingredients for bringing out the sweetness of the baked pumpkin - a combination of ground lamb, onions and tomatoes, brown rice, and spices with echoes of North Africa. 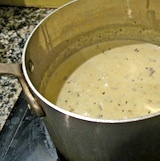 I've added a few variations after the recipe. This recipe starts with a small pumpkin - here in Boston, we usually call them "sugar pumpkins" but markets in your area may call them "pie pumpkins" or even "cooking pumpkins." When you cut them open, they have fairly thick orange-colored flesh. What you do NOT want to get is a large jack-o-lantern pumpkin. 1. Heat the olive oil in a large skillet, and add the onions. Cook over a medium heat for about 5 minutes until the onions begin to turn translucent. 2. While the onions cook, cut the top off the pumpkin, as though you were making a jack-o-lantern, and scoop out the seeds and fibers. 3. 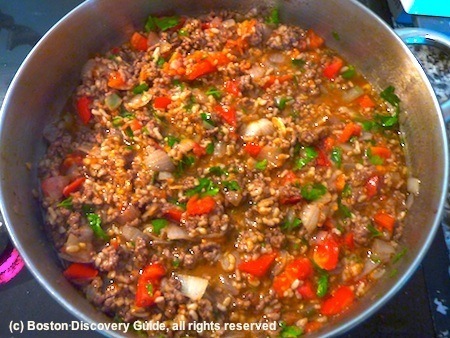 Add the ground lamb to the onions, using a fork to break it into small pieces, and cook until it begins to turn brown - about 5 minutes. 4. Stir in the spices and other seasonings except for the parsley. Let them cook for about a minute, stirring the mixture so that it doesn't burn. Stir in the tomatoes, rice, and parsley. The mixture should be moist. If it seems dry, add a little water. 4. Stir in the spices and other seasonings except for the parsley. Let them cook for about a minute, stirring the mixture so that it doesn't burn. Stir in the tomatoes, rice, and parsley. The mixture should be moist. If it seems dry, add a little water. 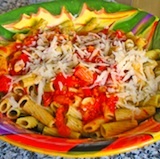 Cook for 3-5 more minutes, until the tomatoes and rice are heated through, and then remove from the stove. 5. 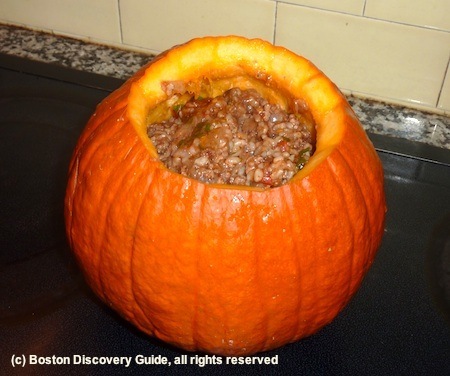 Using a large ladle or even a cup, fill the pumpkin with the meat and vegetable mixture. Place the stuffed pumpkin on a baking tray (line with with aluminum foil for easier clean-up), and place the pumpkin top back on. 6. 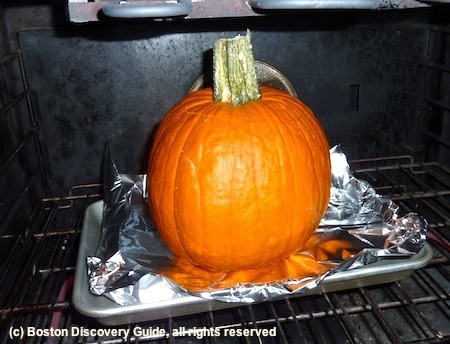 Here's the tricky part - be sure your pumpkin fits in your oven! You'll probably have to take out a rack. My most recent stuffed pumpkin, show in the photo above, was still too tall to fit, even on the lowest rack, so I had to cut off the top of the pumpkin stem. Let me tell you, pumpkin stems are tough - even though I did finally manage to hack it off with a knife, I thought for awhile that I was going to have to borrow my husband's Sawzall. Bake your pumpkin for about 2 hours, until the sides become soft and the liquid in the mixture inside bubbles, indicating that it's cooked through. 7. Remove the pumpkin from the oven, and let it cool for a few minutes. Then, very carefully, place it on a platter for serving, and remove the top. As you can see in the photo at the top of this page, the pumpkin will become gorgeously bronzed from all that time in the oven. If I were serving it for guests, I'd garnish the platter with sprigs of rosemary, parsley, or some other herb. Substitute ground beef, fresh sweet or Italian sausage (take it out of the casing), ground turkey, or two cups of cooked chick peas for the ground lamb. What is the origin of this stuffed pumpkiin recipe? 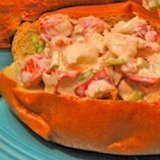 I don't know - some of my friends say it's French, some swear it's Italian, and still others call it a New England or Boston recipe. Bottom line: adjust the ingredients to suit your taste, and you can call it your own!